O ALMIGHTY God, who hast instructed thy holy Church with the heavenly doctrine of thy Evangelist Saint Mark; Give us grace that, being not like children carried away with every blast of vain doctrine, we may be established in the truth of thy holy Gospel; through Jesus Christ our Lord. Amen. Ephesians iv. 7. 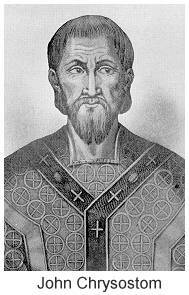 St. John xv. 1. UNTO every one of us is given grace according to the measure of the gift of Christ. Wherefore he saith, When he ascended up on high, he led captivity captive, and gave gifts unto men. (Now that he ascended, what is it but that he also descended first into the lower parts of the earth? He that descended is the same also that ascended up far above all heavens, that he might fill all things.? And he gave some, apostles; and some, prophets; and some, evangelists; and some, pastors and teachers; for the perfecting of the saints, for the work of the ministry, for the edifying of the body of Christ: till we all come in the unity of the faith, and of the knowledge of the Son of God, unto a perfect man, unto the measure of the stature of the fulness of Christ: that we henceforth be no more children, tossed to and fro, and carried about with every wind of doctrine, by the sleight of men, and cunning craftiness, whereby they lie in wait to deceive; but speaking the truth in love, may grow up into him in all things, which is the head, even Christ: from whom the whole body fitly joined together and compacted by that which every joint supplieth, according to the effectual working in the measure of every part, maketh increase of the body unto the edifying of itself in love. I AM the true vine, and my Father is the husbandman. Every branch in me that beareth not fruit he taketh away: and every branch that beareth fruit, he purgeth it, that it may bring forth more fruit. Now ye are clean through the word which I have spoken unto you. Abide in me, and I in you. As the branch cannot bear fruit of itself, except it abide in the vine; no more can ye, except ye abide in me. I am the vine, ye are the branches: he that abideth in me, and I in him, the same bringeth forth much fruit: for without me ye can do nothing. If a man abide not in me, he is cast forth as a branch, and is withered; and men gather them, and cast them into the fire, and they are burned. If ye abide in me, and my words abide in you, ye shall ask what ye will, and it shall be done unto you. Herein is my Father glorified, that ye bear much fruit; so shall ye be my disciples. As the Father hath loved me, so have I loved you: continue ye in my love. If ye keep my commandments, ye shall abide in my love; even as I have kept my Father's commandments, and abide in his love. These things have I spoken unto you, that my joy might remain in you, and that your joy might be full. 1. 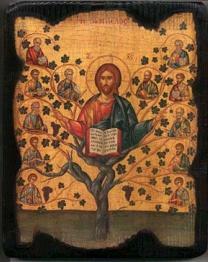 This passage of the Gospel, brethren, where the Lord calls Himself the vine, and His disciples the branches, declares in so many words that the Mediator between God and men, the man Christ Jesus, is the head of the Church, and that we are His members. For as the vine and its branches are of one nature, therefore, His own nature as God being different from ours, He became man, that in Him human nature might be the vine, and we who also are men might become branches thereof. What mean, then, the words, "I am the true vine"? Was it to the literal vine, from which that metaphor was drawn, that He intended to point them by the addition of "true"? For it is by similitude, and not by any personal propriety, that He is thus called a vine; just as He is also termed a sheep, a lamb, a lion, a rock, a corner-stone, and other names of a like kind, which are themselves rather the true ones, from which these are drawn as similitudes, not as realities. But when He says, "I am the true vine," it is to distinguish Himself, doubtless, from that [vine] to which the words are addressed: "How art thou turned into sourness, as a strange vine?" For how could that be a true vine which was expected to bring forth grapes and brought forth thorns? 2. "I am," He says, "the true vine, and my Father is the husbandman. Every branch in me that beareth not fruit, He taketh away; and every one that beareth fruit, He purgeth it, that it may bring forth more fruit." Are, then, the husbandman and the vine one? Christ is the vine in the same sense as when He said, "The Father is greater than I;" but in that sense wherein He said, "I and my Father are one," He is also the husbandman. And yet not such a one as those, whose whole service is confined to external labor; but such, that He also supplies the increase from within. "For neither is he that planteth anything, neither he that watereth; but God that giveth the increase." But Christ is certainly God, for the Word was God; and so He and the Father are one: and if the Word was made flesh,-that which He was not before,-He nevertheless still remains what He was. And still more, after saying of the Father, as of the husbandman, that He taketh away the fruitless branches, and pruneth the fruitful, that they may bring forth more fruit, He straightway points to Himself as also the purger of the branches, when He says, "Now ye are clean through the word which I have spoken unto you." Here, you see, He is also the pruner of the branches-a work which belongs to the husbandman, and not to the vine; and more than that, He maketh the branches His workmen. For although they give not the increase, they afford some help; but not of themselves: "For without me," He says, "ye can do nothing." And listen, also, to their own confession: "What, then, is Apollos, and what is Paul? but ministers by whom ye believed, even as the Lord gave to every man. I have planted, Apollos watered." And this, too, "as the Lord gave to every man;" and so not of themselves. In that, however, which follows, "but God gave the increase," He works not by them, but by Himself; for work like that exceeds the lowly capacity of man, transcends the lofty powers of angels, and rests solely and entirely in the hands of the Triune Husbandman. "Now ye are clean," that is, clean, and yet still further to be cleansed. For, had they not been clean, they could not have borne fruit; and yet every one that beareth fruit is purged by the husbandman, that he may bring forth more fruit. He bears fruit because he is clean; and to bear more, he is cleansed still further. For who in this life is so clean as not to be in need of still further and further cleansing? seeing that, "if we say that we have no sin, we deceive ourselves, and the truth is not in us; but if we confess our sins, He is faithful and just to forgive us our sins, and to cleanse us from all unrighteousness;" to cleanse in very deed the clean, that is, the fruitful, that they may be so much the more fruitful, as they have been made the cleaner. 3. "Now ye are clean through the word which I have spoken unto you. Why does He not say, Ye are clean through the baptism wherewith ye have been washed, but "through the word which I have spoken unto you," save only that in the water also it is the word that cleanseth? Take away the word, and the water is neither more nor less than water. The word is added to the element, and there results the Sacrament, as if itself also a kind of visible word. For He had said also to the same effect, when washing the disciples' feet, "He that is washed needeth not, save to wash his feet, but is clean every whit." And whence has water so great an efficacy, as in touching the body to cleanse the soul, save by the operation of the word; and that not because it is uttered, but because it is believed? For even in the word itself the passing sound is one thing, the abiding efficacy another. "This is the word of faith which we preach," says the apostle, "that if thou shalt confess with thy mouth that Jesus is the Lord, and shalt believe in thine heart that God hath raised Him from the dead, thou shalt be saved. For with the heart man believeth unto righteousness, and with the mouth confession is made unto salvation." Accordingly, we read in the Acts of the Apostles, "Purifying their hearts by faith;" and, says the blessed Peter in his epistle, "Even as baptism doth also now save us, not the putting away of the filth of the flesh, but the answer of a good conscience." "This is the word of faith which we preach," whereby baptism, doubtless, is also consecrated, in order to its possession of the power to cleanse. For Christ, who is the vine with us, and the husbandman with the Father, "loved the Church, and gave Himself for it." And then read the apostle, and see what he adds: "That He might sanctify it, cleansing it with the washing of water by the word." The cleansing, therefore, would on no account be attributed to the fleeting and perishable element, were it not for that which is added, "by the word." This word of faith possesses such virtue in the Church of God, that through the medium of him who in faith presents, and blesses, and sprinkles it, He cleanseth even the tiny infant, although itself unable as yet with the heart to believe unto righteousness, and to make confession with the mouth unto salvation. All this is done by means of the word, whereof the Lord saith, "Now ye are clean through the word which I have spoken unto you." 1. Jesus called Himself the vine, and His disciples the branches, and His Father the husbandman; whereon we have already discoursed as we were able. But in the present passage, while still speaking of Himself as the vine, and of His branches, or, in other words, of the disciples, He said, "Abide in me, and I in you." They are not in Him in the same kind of way that He is in them. And yet both ways tend to their advantage, and not to His. For the relation of the branches to the vine is such that they contribute nothing to the vine, but from it derive their own means of life; while that of the vine to the branches is such that it supplies their vital nourishment, and receives nothing from them. And so their having Christ abiding in them, and abiding themselves in Christ, are in both respects advantageous, not to Christ, but to the disciples. For when the branch is cut off, another may spring up from the living root; but that which is cut off cannot live apart from the root. 2. And then He proceeds to say: "As the branch cannot bear fruit of itself, except it abide in the vine; no more can ye, except ye abide in me." A great encomium on grace, my brethren,-one that will instruct the souls of the humble, and stop the mouths of the proud. Let those now answer it, if they dare, who, ignorant of God's righteousness, and going about to establish their own, have not submitted themselves unto the righteousness of God. Let the self-complacent answer it, who think they have no need of God for the performance of good works. Fight they not against such a truth, those men of corrupt mind, reprobate concerning the faith, whose reply is only full of impious talk, when they say: It is of God that we have our existence as men, but it is of ourselves that we are righteous? What is it you say, you who deceive yourselves, and, instead of establishing freewill, cast it headlong down from the heights of its self-elevation through the empty regions of presumption into the depths of an ocean grave? Why, your assertion that man of himself worketh righteousness, that is the height of your self-elation. But the Truth contradicts you, and declares, "The branch cannot bear fruit of itself, except it abide in the vine." Away with you now over your giddy precipices, and, without a spot whereon to take your stand, vapor away at your windy talk. These are the empty regions of your presumption. But look well at what is tracking your steps, and, if you have any sense remaining, let your hair stand on end. For whoever imagines that he is bearing fruit of himself is not in the vine, and he that is not in the vine is not in Christ, and he that is not in Christ is not a Christian. Such are the ocean depths into which you have plunged. 3. Ponder again and again what the Truth has still further to say: "I am the vine," He adds, "ye are the branches: he that abideth in me, and I in him, the same bringeth forth much fruit; for without me ye can do nothing." For just to keep any from supposing that the branch can bear at least some little fruit of itself, after saying, "the same bringeth forth much fruit," His next words are not, Without me ye can do but little, but "ye can do nothing." Whether then it be little or much, without Him it is impracticable; for without Him nothing can be done. For although, when the branch beareth little fruit, the husbandman purgeth it that it may bring forth more; yet if it abide not in the vine, and draw its life from the root, it can bear no fruit whatever of itself. And although Christ would not have been the vine had He not been man, yet He could not have supplied such grace to the branches had He not also been God. And just because such grace is so essential to life, that even death itself ceases to be at the disposal of free-will, He adds, "If any one abide not in me, he shall be cast forth as a branch, and wither; and they shall gather him, and cast him into the fire, and he is burned." The wood of the vine, therefore, is in the same proportion the more contemptible if it abide not in the vine, as it is glorious while so abiding; in fine, as the Lord likewise says of them in the prophet Ezekiel, when cut off, they are of no use for any purpose of the husbandman, and can be applied to no labor of the mechanic. The branch is suitable only for one of two things, either the vine or the fire: if it is not in the vine, its place will be in the fire; and that it may escape the latter, may it have its place in the vine. 4. "If ye abide in me," He says, "and my words abide in you, ye shall ask what ye will, and it shall be done unto you." For abiding thus in Christ, is there aught they can wish but what will be agreeable to Christ? So abiding in the Saviour, can they wish anything that is inconsistent with salvation? Some things, indeed, we wish because we are in Christ, and other things we desire because still in this world. For at times, in connection with this our present abode, we are inwardly prompted to ask what we know not it would be inexpedient for us to receive. But God forbid that such should be given us if we abide in Christ, who, when we ask, only does what will be for our advantage. Abiding, therefore, ourselves in Him, when His words abide in us we shall ask what we will, and it shall be done unto us. For if we ask, and the doing follows not, what we ask is not connected with our abiding in Him, nor with His words which abide in us, but with that craving and infirmity of the flesh which are not in Him, and have not His words abiding in them. For to His words, at all events, belongs that prayer which He taught, and in which we say, "Our Father, who art in heaven." Let us only not fall away from the words and meaning of this prayer in our petitions, and whatever we ask, it shall be done unto us. For then only may His words be said to abide in us, when we do what He has commanded us, and love what He has promised. But when His words abide only in the memory, and have no place in the life, the branch is not to be accounted as in the vine, because it draws not its life from the root. It is to this distinction that the word of Scripture has respect, "and to those that remember His commandments to do them." For many retain them in their memory only to treat them with contempt, or even to mock at and assail them. It is not in such as have only some kind of contact, but no connection, that the words of Christ abide; and to them, therefore, they will not be a blessing, but a testimony against them; and because they are present in them without abiding in them, they are held fast by them for the very purpose of being judged according to them at last.